Curling Contractors is a fencing, agricultural and equestrian contractor specialising in land and perimeter solutions based in Surrey and servicing the whole of the South, South East and Home Counties. 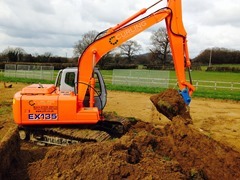 Curling Contractors design, develop and install high quality riding and polo arenas and also undertake large areas of site clearance, selective clear felling of woodland and forest ride maintenance. Country Estates – from hard landscaping, scrub and land clearance, pheasant pens through to estate railings. 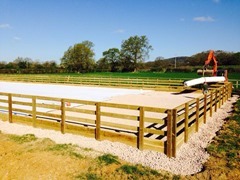 Equestrian fencing and groundworks – comprised of horse netting, electric tape fencing, stable bases and concrete slabs, polo arenas, maneges, water pipes and troughs. Agricultural fencing and groundworks– for stock control of deer, sheep, cattle, rabbits and including pheasant pens and, horticultural and viticulture trellis work. Commercial fencing and construction solutions– from wrought iron railings to crowd control fencing at stadiums.